Do popular songs aim low? According to the French wikipedia, Serge Gainsbourg’s ‘Le Poinçonneur des Lilas’ was a hit in 1959. It is a poem about a ‘ticket puncher’ in Mairie des Lilas (a railway station in Paris) who talks very quickly about punching holes in tickets all day and about someone making a final hole for him, where he won’t have to listen to talk about holes any more. Serge Gainsbourg photographed by Claude Truong Ngoc, 1981. (The original music video—with English subtitles—is also on YouTube, but the audio track is not clear.) “The main road,” which the persona of the poem says he hopes to leave, is actually, in the French lyric, “la grand’route” or ‘the great highway’—surely a reference to the road we all take to the grave. The song is a poetic and political act of empathy, and of a kind that has become rare in the sanitised marketplace of popular songs. And it is the poetry that saves it from being only political ideology and lifts it into the realm of art. Gainsbourg died in 1991, having established himself as one of the world’s most influential popular composers and performers. Toner-gate, Victoria’s little arts scandal, revealed some interesting facts about government and administration of the arts. Firstly, public sector employees working in the arts believe that going to arts events is “a fundamental obligation of their professional life”. Penny Hutchinson, Director of Arts Victoria, rejects the idea that free tickets to arts events should be registered as gifts. The Ombudsman concluded, “a lack of management and auditing at Arts Victoria contributed to a culture that allowed the corrupt conduct to go undetected”. Secondly, the Director of Arts Victoria told the Ombudsman that department employees keep a diary of their attendance at arts events. However, neither the Arts Victoria website nor the Department of Premier and Cabinet (DPC) annual reports of Arts Victoria’s activities contain statistical information gathered from employees or arts organisations about the numbers of tickets given away, for this or any other purpose. Detailed statistical information about attendance at arts events comes mainly from Australian Bureau of Statistics data from census interviews. The Arts Victoria website is an analytical wasteland. Sure, you can find out how much money the government spent and on what projects. When percentages and dollar figures are provided, they all point to the munificence of the public purse and the crucial role of the arts in the economy. They are statistics served up like comfort food to make the public sleep. Third, though Toner-gate is trivial compared to other public sector governance problems (annual expenditure on ICT in Victoria is around $1.6 billion), the numbers are not trivial to artists themselves—especially artists, like writers and poets, who are not part of the ‘color and movement’ industry. Chris Flynn, who organises writers’ events in Melbourne, posted on Facebook the day the Toner-gate news broke, “Thank God I didn’t get those Arts Victoria grants after all—turns out they needed 80 grand to buy toner.” I suspect this reaction would be mild among writers. The ABC’s comedy series ‘Angry Boys’ was viewed by “just” 569,000 viewers on Wednesday 15 June 2001, when it went head-to-head with broadcast of a state of origin rugby union match. Chris Lilley, the comedic artist in question, must think that such contests are a harsh proving ground. Go the Melbourne Symphony Orchestra (MSO) website and look at the 2010 annual report and you will find that in 2010 the total audience for 2010 was 181,387. The total “paid attendance” was just 121,330. It’s not clear from the report whether any of these figures includes free concerts in the park (40,000 in attendance) or other outreach programs. Using the two available numbers, 33 per cent of seats at concerts are given away. The Victorian Opera annual report includes the tantalising remark that audience figures are prepared according the standard Arts Victoria methodology. Gosh. Arts Victoria has a methodology for counting audience numbers? —Its annual report does not say what it is. Neither does its website. And this is strange because performing arts publications make so many remarks about audience numbers, it would be handy to know if there is a ‘special’ way of counting them. The VO says that the total audience in 2010 was 41,799. This number includes dress rehearsals, educational and promotional events, and even 6,500 at free concert in The Bowl with the MSO. Leave all free seats in, and any others that may or may not be free, and divide it into the total of government grants (including a small sum from the federal funding body), and it appears that every single seat at an opera event is subsidised to the tune of $91. This figure is closer to $150 if you exclude seats given away for whatever reason; but, because we don’t know how many seats are filled by arts administrators for the purposes of “professional obligation”, there is no way of telling how high the figure goes. To be fair, the numbers should look better if one took into account that public funds also pay for modest administration, marketing and other expenses. None of this even touches on the extraordinarily generous donations received by the operatic arts by various kinds of patrons, though it is interesting to note that the VO annual report has two not-quite-full pages of these donors’ names, some of whom gave over $20,000 and at least one (I wonder who?) who came up with $2. 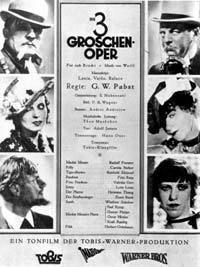 The Threepenny Opera was one of the first musical films. Weil and Brecht filed lawsuits against the production company over its handling of the script and music; and both collected damages. The film was screened for the first time in February 1931. And the numbers were especially healthy in 2010 because of the spectacular success of Kurt Weil’s ‘Threepenny Opera’. More than ten thousand people attended 22 performances, about two and half times more than the next most attended opera and about five times more than most. Arts Victoria’s and DPC’s websites used to bulge with business plans and targets related to the ‘Creative Capacity +’ framework for arts development in Victoria, a document that, now, even Google can’t find in the Orwellian memory hole of documents published on the Internet.1 I used to look into them to wonder, as I do now after Toner-gate, how little light these numbers, goals and performance measures throw on the ironies of arts funding. Why, if nearly a third of seats at some concerts are unpaid for, is there no detailed information about how the seats are filled? Why, if public taxes pay for astonishingly expensive artistic productions, are these productions not televised? Why, considering apparent waste and inefficiency, can no public funds be found to support a poetry recitation prize for Victorian secondary school students? And why, if Mr and Mrs Been-to-La-Boheme-six-times can have their seats subsidised without filling out a form in triplicate, are the processes for writers’ grants so damned complicated and exhausting? Why, if arts administrators can have free tickets to attend arts events, can we not provide the same advantages to artists themselves? I could, within a week if asked, provide a list of several hundred creative writers whose artistic education would be enhanced by nights at the opera and in our concert halls and theatres, myself included. Penny Hutchinson’s tortured responses to the Ombudsman’s report demonstrate, amongst many other things, that she has no imagination. Maybe that’s what it costs you when “professional obligation” takes you out for a night on the town.